She Takes on The World is an award-winning business + lifestyle blog for career-minded women and women entrepreneurs. 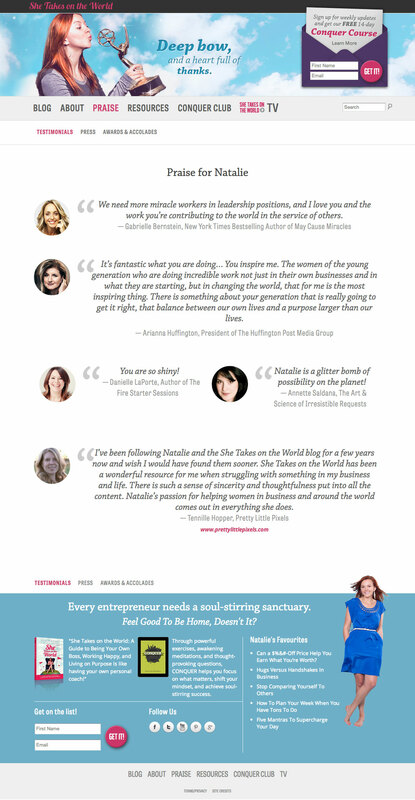 This 2013 launch of She Takes on The World won Website of the Year at the Stevie Awards for Women in Business. Natalie’s website was growing rapidly; with well over 50 contributors, and new books and services launching soon, she needed a unified vision for her brand that could better reflect where the website and her business were heading. We decided to significantly decrease the clutter, remove the typical blog sidebar altogether, and focus on making all of the content easy to find and access. With a goal of doubling her newsletter subscribers, we decided to keep a playful opt-in consistently in all her headers, and have it disappear on smaller browser sizes in order to keep the site clean and focused. We re-imagined her blog categories with a colour-coded system, and included a special treatment for “TV” posts, which tie in with Natalie’s Youtube channel. Focusing on the needs of site’s users, (with people looking for resources vs an opportunity to “shop”) we decided to organize all non-blog resources into a generic resources page containing both free and paid digital and tangible products. We used a simple interactive map to demonstrate the global nature of Natalie’s brand, and the reach of her community. The website is totally responsive, and features mobile style sheets to accommodate for various mobile devices, including ipad and iphone. Working with Natalie was an absolute pleasure. I used to dream about working with a designer and developer like Marie, someone who could take my vision and fuse it with their own creative prowess to create a digital masterpiece. When I first got in touch with Marie I told her I had a goal of turning SheTakesOnTheWorld.com into a gorgeous online experience that was second to none in my niche. She was up for the challenge, and absolutely blew the top off my expectations. I have finally found the web designer of my dreams. I also helped Natalie set up a number of customized landing pages for her unique launches.